Migrating unstructured file data between storage systems is complex; solutions such as rsync or robocopy are not scalable, require many time-consuming checks, and can lead to data loss. Learn how to rapidly and seamlessly migrate your unstructured data between heterogeneous storage like NAS, distributed, or parallel file systems. 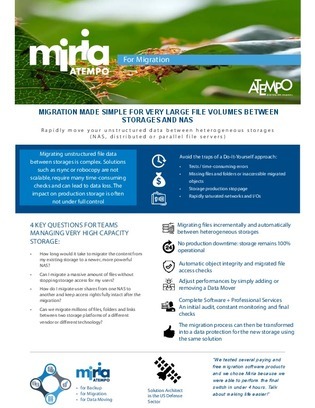 Continue reading for the answers to 4 migration FAQs and a glimpse at a platform that can automatically migrate unstructured data volumes between storage environments.